Keiro Senior HealthCare residents, staff, families, leadership, and volunteers were saddened by the passing of Keiro founder George Aratani on Feb. 19. In 1961, Aratani was a central founder of Keiro Senior HealthCare, which today has enabled over 130,000 families to receive affordable, culturally sensitive senior care. It was Aratani who suggested the name Keiro, which means “respect for our elders,” as the name for the organization. Aratani worked to advance the community and encouraged others, both in the U.S. and in Japan, to join him in supporting Keiro. He made many trips to Japan with co-founder Fred Wada to request support for nursing facilities and later a retirement home facility in Los Angeles. 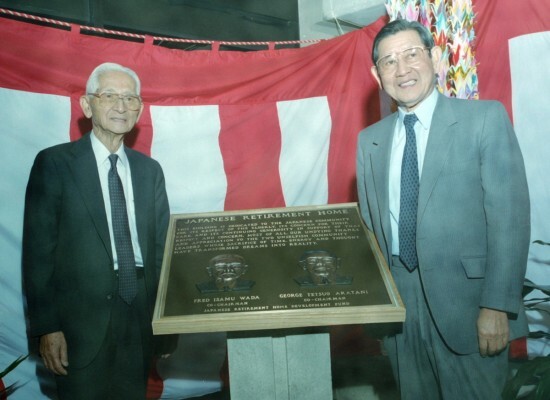 Bilingual and bicultural, Aratani was able to convince the Keidanren, a Japanese consortium of financial and industrial companies, to grant Keiro tax-exempt status, clearing the way for Japanese to financially support the Japanese American community. Aratani had great compassion for the elderly and foresight in planning for future needs. In 1999, moved by the plight of a personal friend, he advocated for the establishment of a special care facility at Keiro Nursing Home for community members afflicted with dementia and Alzheimer’s disease. Later, he supported Keiro’s healthy aging initiatives and genki living programs through The Institute for Healthy Aging.